How long have I been collecting? I’ve been collecting since about Urban 2’s release. I didn’t realize then how popular things would be and several times passed up on opportunities to purchase both “Ham and Eggs” and “Carnotaurus” 9 inch. I kick myself to this day. My favorite figure I own? Tough call, but I’d have to say Sulley and Boo! Favorite figure I don’t own? Mine Mine Mine is my current Holy Grail. Anyway, enough about me! While the rest of the Destination Vinylmation crew was busy trading, I took it upon myself (as the newest member of the team) to head over to the trade box and upcoming release table and ask some questions about the imminent releases. Park 6, as seen above, is set to be released on April 1. If you remember, Disney announced an April 1 release date, then retracted it because the product wasn’t at WDW yet. But according to the cast member behind-the-counter, that date is back on! Check out Park 6 Explained for more. 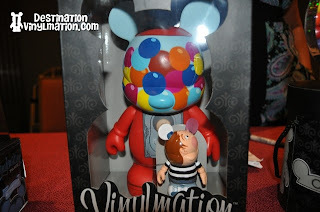 This is a good time to point out the glaring lack of Steven Miller, Vinylmation’s tried and true “Ambassador of Trading”. According to the Disney cast members at the event, Steven has moved up to another position within Disney. Several pin traders took to calling the two women who were helping organize the event “Steven” as an homage to Mr. Miller. He will be missed. 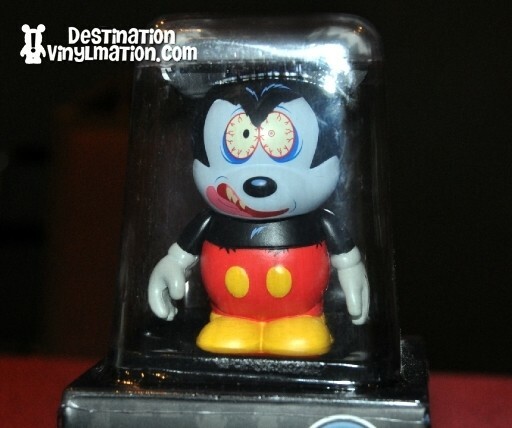 Also being released with Park 6 is the Park 6 Combo Topper, which features Mickey Mouse from his highly popular animated short “Runaway Brain”. This 3 inch, as shown above, will go great with the recently released Villains 9” Julius + Minnie Jr. combo. 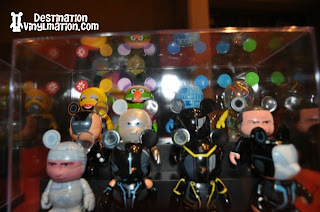 Other releases shown were TRON (March 25) and a couple already known Muppets 2 (April 15) figures. Also shown was the newly announced Celebration series which will be packaged and sold just like the Occupations released a couple weeks ago. Also shown was the 9” + 3” Urban 6 combo of a Bubble Gum machine and boy blowing a bubble! While no samples were on display, we also received confirmation that the Duck Tales 2-Figure set from the “Disney Afternoon” series will be released on April 8, although there were some discrepancies on whether or not the set would be online exclusive like the previously released “Talespin” set or in D-Street, as Disney previously announced it would be. All in all it was a successful trade event. LOTS of Vinylmation traders peppered the sea of pin traders, and there finally seemed to be a healthy amount of trading happening. This is also likely because of the lack of a trade night in 2011 before March, and lots of new product has been released recently. 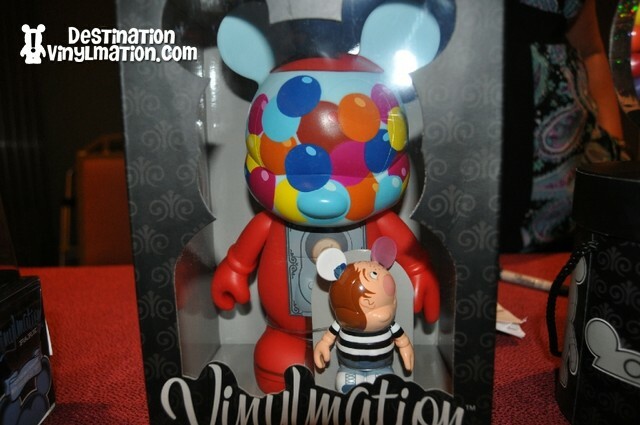 Thanks for reading, and until next time… make YOUR Destination, Vinylmation! Do you know when the Gumball 9inch w/ the 3 inch boy will be released (and where it will be sold)? Any info would be very helpful. Thanks!!!! No official word on any of that. We assume that the set will be sold in D-Streets, sometime in the near future. But that’s all just educated guesses.